Toyota Motor Corp., struggling to contain the damage from the continuing controversy over unintended acceleration in some of its cars, has elected to indefinitely halt sales of eight models, including the Camry, America's best-selling automobile, and the Corolla, the practical compact model on which the Japanese automaker built its reputation for quality and durability. As part of its effort to address sticking accelerators, it will also recall 2.3 million vehicles. Carmakers call back vehicles for repairs all the time, but Toyota's efforts to address complaints, coming on the heels of its 4.2 millioncar recall in November to address similar issues, were described by the automotive website Edmunds.com as unprecedented. "Helping ensure the safety of our customers and restoring confidence in Toyota are very important to our company," says Bob Carter, Toyota's group vice president and general manager. "This action is necessary until a remedy is finalized. We're making every effort to address this situation for our customers as quickly as possible." Toyota officials note that since the fall, the company has been conducting an exhaustive review of factors that might have contributed to the growing number of unintended-acceleration cases filed with the National Highway Traffic Safety Administration. Pinning down the cause of unintended acceleration is extremely difficult, automotive-engineering experts say, because laboratory tests may not be able to replicate unusual situations that arise in real-world driving. Some analysts compared Toyota's decision to suspend sales of several popular models to Johnson & Johnson's 1982 decision to sweep packages of Tylenol off shelves after some were found to have been criminally tainted with poison after being shipped to stores. Tylenol's market share plunged from 35% to 8%, but it soon recovered, and J&J was applauded for its quick response. But a recall in the car business, with its five-figure price tags, independent dealers, layers of financing and intense competition, is more complex than a packaged-medicine recall. The halt to sales is forcing Toyota to suspend production at five plants, idling more than 20,000 workers and leaving 1,200 Toyota dealers sitting with roughly 250,000 unsold  and for now, unsalable  vehicles worth nearly $50 billion. 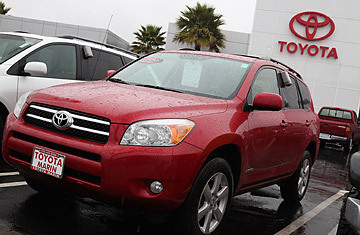 Jesse Toprak, an analyst with TrueCar.com, says Toyota will probably have to help the dealers finance the inventory as the sales freeze continues. Financing inventory, however, is only one part of the equation. Consumers have more choices now; the competition has gotten much tougher. Also, consumers are much less loyal to brands, so the negative impact could be more severe. "Toyota is big enough to survive, but this hits them at the core. The recovery plan coming out of this mess is going to be critical," says Toprak, who suggests that Toyota will probably have to spend heavily on advertising and incentives to restart sales when the problem is finally identified. Toprak believes that Toyota's problems could prompt consumers to take a second look at American brands such as Ford and Chevrolet and could also boost Korean nameplates such as Hyundai and Kia, which have lineups that closely match Toyota's. Even European luxury makers such as Mercedes-Benz and BMW, which have been eclipsed by Toyota's Lexus brand, could benefit, he says. Toyota officials insist that the company's reputation for quality, reliability and durability, which is at the heart of Toyota's brand appeal to consumers, will survive. Judging from the automaker's new advertising campaign  which extols the reliability and durability of the company's vehicles and notes that 80% of the Toyotas sold in the past few decades are still on the road  company executives are clearly concerned about the fallout from sharply rising recalls. Another sign of their anxiety: the automaker is stepping up plans to make some expensive safety options, like electronic stability control, standard in all its vehicles. Toyota hasn't tallied how much the recall will cost, said Yoshimi Inaba, the company's top executive in the U.S., after a speech in Detroit. But he said Toyota is committed to using the recalls to impress customers with the company's service. "It is an opportunity to prove ourselves to them," he said. Inaba also noted that Toyota continues to invest heavily in research and development, spending more than $9 billion in 2009, "with emphasis on safety and on the environment." Nevertheless, Toyota faces significant challenges from both Volkswagen AG and a re-emergent General Motors Corp. as it struggles to keep its standing as the world's top automaker. Both Volkswagen and GM are in a better position to cash in on growth in key emerging markets such as Brazil, Russia, India and China, according to a new study by the Boston Consulting Group. Inaba said Toyota plans to launch 10 new products this year, beginning with a redesigned 2011 Sienna minivan and later with the official launch of a $375,000 Lexus supercar, the carbon-fiber LFA. Also, the Toyota Scion will expand its product line. Inaba is probably digesting the reality that replacing GM as the world's top automaker hasn't been nearly as satisfying, or as durable, as he had once hoped. Read "Chasing GM, Toyota Traded Quality for Quantity." See TIME's exclusive photos from the Haiti earthquake.